The famous call, made nineteen years ago by Appadurai and Kopytoff, that students of material culture should study the ‘social life’ of things has, until now, had a limited effect upon students of the Italian Renaissance. 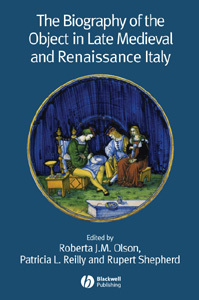 The essays in this book – part of the recent burgeoning interest in Italian Renaissance material culture – rise to Appadurai and Kopytoff’s challenge, examining the ‘lives’ led by objects in late-medieval and Renaissance Italy: their creations, lives and subsequent after-lives. 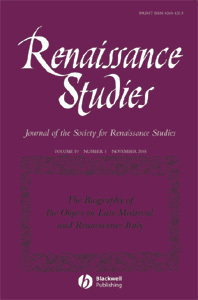 Situating the objects and their biographies in their cultural, social and economic contexts, the nine essays discuss the social lives of a range of objects in late-medieval and renaissance Italy: maiolica, sculpture, artist’s autobiographies, plate for the table, cassoni, glassware, prostitutes’ jewellery, miraculous painted images, choir-screens, chapels, and antiquities. Nicholas Penny, in an introductory essay, discusses the forms of evidence at the disposal of students of material culture, and their relationship to the objects whose lives they seem to illuminate.